For other uses, see Yogi (disambiguation). A yogi (sometimes spelled jogi) is a practitioner of yoga. In Vedic Sanskrit, yoga (from the root yuj) means "to add", "to join", "to unite", or "to attach" in its most common literal sense, whereas in recent days, especially in the West, yoga often means only the physical exercises of hatha yoga, the asanas. The term yogi is used broadly to refer to sannyasi or practitioners of meditation in a number of Indian religions. The feminine form is yogini, but is not always used, especially in the West. 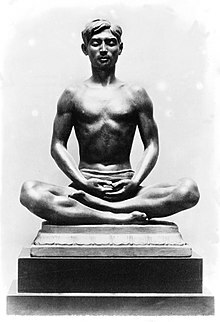 Yogi, or jogi, since the 12th century CE, while meaning those dedicated to Yoga practice, has also referred to members of the Nath siddha tradition of Hinduism. Alternatively, in tantra traditions of Hinduism, Buddhism and Jainism, a practitioner of tantra (a tantrika) may also be called a yogi. In Hindu mythology, god Shiva and goddess Parvati are depicted as an emblematic yogi–yogini pair. In Classical Sanskrit, the word yogi (Sanskrit: masc yogī, योगी; fem yoginī) is derived from yogin, which refers to a practitioner of yoga. Yogi is technically male, and yoginī is the term used for female practitioners. The two terms are still used with those meanings today, but the word yogi is also used generically to refer to both male and female practitioners of yoga and related meditative practices belonging to any religion or spiritual method. The term yogini is also used for divine goddesses and enlightened mothers, all revered as aspects of the mother goddess, Devi. In Hinduism the term yogi refers to an adherent of yoga. Carrying within oneself fire and poison, heaven and earth, ranging from enthusiasm and creativity to depression and agony, from the heights of spritual bliss to the heaviness of earth-bound labor. This is true of man in general and the [Vedic] Keśin in particular, but the latter has mastered and transformed these contrary forces and is a visible embodiment of accomplished spirituality. He is said to be light and enlightenment itself. The Keśin does not live a normal life of convention. His hair and beard grow longer, he spends long periods of time in absorption, musing and meditating and therefore he is called "sage" (muni). They wear clothes made of yellow rags fluttering in the wind, or perhaps more likely, they go naked, clad only in the yellow dust of the Indian soil. But their personalities are not bound to earth, for they follow the path of the mysterious wind when the gods enter them. He is someone lost in thoughts: he is miles away. —  Karel Werner (1977), "Yoga and the Ṛg Veda: An Interpretation of the Keśin Hymn"
The term yogin appears in Katyayana Shrauta-sutra and chapter 6 of Maitri Upanishad, where the implied context and meaning is "a follower of the Yoga system , a contemplative saint". The term sometimes refers to a person who belongs to the Natha tradition. They usually belong to Shaiva tradition, but some Natha belong to the Vaishnava tradition. In both cases, states David Lorenzen, they practice yoga and their principal god tends to be Nirguna, that is a god that is without form and semi-monistic, influenced in the medieval era by the Advaita Vedanta school of Hinduism, Madhyamaka school of Buddhism, as well as Tantra and Yogic practices. A 10th-century Yogini statue from Tamil Nadu, India. She is seated in an asana, and her eyes are closed in meditative state. A yogi or yogini aspires to Brahmacharya (Sanskrit: ब्रह्मचर्य), which means celibacy if single, or non-cheating on one's partner. There have been two parallel views, in Hindu texts, on sexuality for a yogi and yogini. One view asserts restraint in sexual activity, towards monk- and nun-like asexuality, as transmutation away from worldly desires and onto a spiritual path. It is not considered, states Stuart Sovatsky, as a form of moralistic repression but a personal choice that empowers the yoga practitioner to redirect his or her energies. The second view, found particularly in Tantra traditions according to David Gordon White, asserts that sexuality is an additional means for a yogi or yogini to journey towards and experience the bliss of "one realized god-consciousness for oneself". In the second view, sexuality is a yogic practice, and one broadly revered through the lingam–yoni iconography of Shiva–Parvati, the divine yogi–yogini in Hindu mythology. Both a yogi and a philosopher are seekers of an absolute truth. But they differ in their modes of approach. A philosopher advances in the path of rational logic (theory) and wants to intellectually understand the Truth. A yogi advances in the path of self discipline (practice) and aspires to spiritually realize truth. A sculpture of Gorakhnath, a celebrated yogi of Nath tradition and a major proponent of Hatha yoga. [S]iddha means 'realized, perfected one',[note 2] a term generally applied to a practitioner (sādhaka, sadhu) who has, through his practice (sadhana), realized his dual goal of superhuman powers (siddhis, 'realizations', 'perfections') and bodily immortality (jivanmukti). Archeological evidence suggests that in some contexts and regions, yogi of the Nath Siddha tradition were respected and recognized in India. For example, inscriptions suggest a general of the Yadava king Ramacandra donated a village to a yogi in 13th-century. Near Mangalore, that later became a hub of Nath yogis, a monastery and temple was dedicated to yogis in the 10th-century. David Lorenzen states that the Nath yogis have been very popular with the rural population in South Asia, with medieval era "tales and stories about Nath yogis such as Gorakhnath, Matsyendra, Jalandhar, Gopichand, Bharthari, Kanhapa and Chaurangi" continuing to be remembered in contemporary times, in the Deccan, western and northern states of India and in Nepal. In some contexts, adds White, the term yogi has also been a pejorative term used in medieval India for a Nath siddha, particularly on the part of India's social, cultural and religious elites. The term siddha has become a broad sectarian appellation, applying to Saiva-devotees in the Deccan (Maheśvara siddhas), alchemists in Tamil Nadu (siddhars or sittars), a group of early Buddhist tantrikas from Bengal (mahasiddhas, siddhacaryas), the alchemists of medieval India (rasa siddha), and a mainly north Indian group known as the Nath siddhas. The Nath siddhas are the only still existing representatives of the medieval Tantric tradition, which had disappeared due to its excesses. While the Nath siddhas enjoyed persistent popular success, they attracted the scorn of the elite classes. 17th century Hindu female Nath yogis. The earliest records mentioning female Nath yogis (or yogini) trace to 11th century. According to White, the term yogi, has "for at least eight hundred years, been an all-purpose term employed to designate those Saiva specialists whom orthodox Hindus have considered suspect, heterodox, and even heretical in their doctrine and practice". The yoga as practiced by these Yogis, states White, is more closely identified in the eyes of those critics with black magic, sorcery and sexual perversions than with yoga in the conventional sense of the word. The Nath Yogis were targets of Islamic persecution in the Mughal Empire. The texts of Yogi traditions from this period, state Shail Mayaram, refer to oppressions by Mughal officials such as governor. The Mughal documents confirm the existence of Nath Yogis in each pargana (household neighborhoods), and their persecution wherein Nath Yogis were beheaded by Aurangzeb. According to David Lorenzen, the religious groups in Hinduism that militarized and took up arms following the Muslim conquest of India, to resist persecution, appeared among the Nath or Kanphata yogis, often called simply yogis or jogis. The warrior ascetics were institutionalized as a religious order by Gorakhnath and were expanding in the 13th century, after the establishment of the first Islamic Sultanate in India. They interacted and cooperated with fakirs of Sufi Muslims. The yogis feature prominently in Delhi Sultanate and Mughal Empire period official documents, states David White, both in terms of impressing the ruling elite in the Muslim administration and awards of receiving land grants in some cases such as by Akbar, as well as those yogis who targeted the elite merchants and disrupted the business of administrative Islamic elites in urban areas. In other cases, yogis from the Shaivism, Vaishnavism and Shaktism traditions of Hinduism marshaled armed resistance against the Mughal and British colonial armies. The history of Nath yogis has been diverse, such as in the 11th and 12th centuries, when Buddhists in South India converted to Nath siddha traditions and helped establish Shiva Hindu temples and monasteries. ^ Compare Siddhartha Gautama, one of the names of Buddha. ^ a b c White 2012, p. 8. ^ a b c White 2012, p. 8-9. ^ a b c d Werner, Karel (1977). "Yoga and the Ṛg Veda: An Interpretation of the Keśin Hymn (RV 10, 136)". Religious Studies. 13 (3): 289–302. The Yogis of Vedic times left little evidence of their existence, practices and achievements. And such evidence as has survived in the Vedas is scanty and indirect. Nevertheless, the existence of accomplished Yogis in Vedic times cannot be doubted. ^ Rosen 2012, p. 72. ^ White 2012, pp. 1–6. ^ Lorenzen, David (1972). The Kāpālikas and Kālāmukhas. University of California Press. pp. 186–190. ISBN 978-0520018426. ^ Āgāśe, K. S. (1904). Pātañjalayogasūtrāṇi. Puṇe, India: Ānandāśrama. p. 102. ^ Akshaya Kumar Banerjea (1983). Philosophy of Gorakhnath with Goraksha-Vacana-Sangraha. Motilal Banarsidass. pp. xxi. ISBN 978-81-208-0534-7. ^ a b White 2012, p. 2. ^ a b White 2012, p. 94. ^ Alf Hiltebeitel; Kathleen M. Erndl (2000). Is the Goddess a Feminist? : The Politics of South Asian Goddesses. New York University Press. pp. 40–41. ISBN 978-0-8147-3619-7. ^ White 2012, p. 9. ^ White 2012, pp. 94-101.